At Waikiki Beach Walk, KAIWA is located on the 2nd floor. Fun events are taking place on the ground floor by the water fountain square! 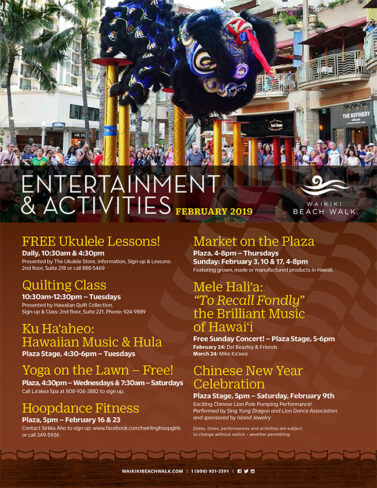 Free classes like ukulele, yoga, hula dance, hula hoop fitness, and quilting! Entertainment also includes free concerts, farmers’ markets, and more! Please come and visit KAIWA after enjoying the activities!